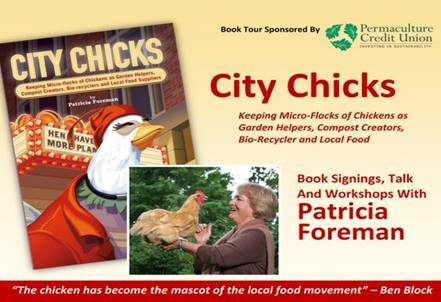 Hi everyone – Remember Pat Foreman, who we hosted for an event in Santa Barbara several years ago? She is starting another one of her online courses soon! Receive copies of over 560 PowerPoint slides for notes. Individual "chick-in" sessions to help you keep up. There is a back-to-the-land, grow-your-own-food movement happening in backyards and on small parcels of land. By employing chickens’ skill sets, and permaculture design in kitchen and production gardens you can grow and produce much of your own eggs, meat, vegetables, fruits and even nuts. This saves on grocery bills, and you are assured your food is wholesome and grown in living, clean soils. With small-scale, labor-saving methods, you will learn how to minimize work and maximize production in your spare time. Developing your own chicken have-more plan is the most practical way to stretch income and keep yourself, and your family, in good health with healthy foods. It is an act of green living! With a certificate suitable for framing! 1. Chickens as the Enablers of Local Foods. 2. Flock Management & Coops From the Chickens' Point-of-view. 3. Brooding & Educating Baby Chicks. 4. Chicken Whispering: Discover the Chicken You Never Knew! 5. Eggs-trodinary Eggs: The Tips, Secrets, Science & Politics of Eggs. 6. Primary Poultry Health Care & The Poultry's Pharmacy. <https://chickensandyou.us6.list-manage.com/track/click?u=067ee0ed82884a8f51dc4912b&id=899af51734&e=ab6229448e> Gain skills that will serve a lifetime! REGISTER NOW! There is a back to the land movement and it’s happing in backyards and on small parcels of land across the planet. By employing chickens’ skill sets, and permaculture design principles in kitchen and production gardens you can grow and produce much of your own vegetables, eggs and meat. This not only saves on grocery bills, but you are assured that your food is grown in living, clean soils and the food, using and preserving heirloom seeds, is high in vitamins and minerals. With small-scale, labor-saving methods, you will learn how to minimize work and maximize production in your spare time, and have fun doing it. Developing your own chicken have-more plan is the most practical way to Occupy Backyards, and at the same time, stretch income and keep yourself, and your family, in good health. This is a comprehensive, class for those who want to keep small family flocks of primarily hens. Beginning with adult birds this workshop covers the main considerations of coop, run design and chicken furniture from the bird's view. We will explore which chicken breeds tend to do best in various climates, runs and coop structures. Nothing is cuter than a baby chick. Watching their rapid development from—peep to pullet—is a miracle. During the brooding time, you have the role of keeper and guardian angel. This intensive, interactive, hands-on course covers chick anatomy & physiology, behavior, health, nutrition, housing, breed selection, and more. All questions will be answered. By the end of the course you will know everything you need to know about successfully—and expertly—raise your very own baby chicks from day one to point-of-lay. There are ways to handle and communicate with chickens that can result in trust, gentleness and even an emotional bond. But first you must learn how a chicken thinks, and prefers to be treated. It’s sometimes not what you think. Some birds can even be trained to serve as therapy chickens and class room assistants. Get close and personal with your biddy buddy. Learn the basics of chicken whispering in this cutting-edge, hands-on, nose-to-beak workshop. Textbook: City Chicks. Eggs are among the most nutritious, easily digestible and absorbed foods available on the planet. Eggs are so adaptable that they can be used for a variety of dishes. They create elegant soufflés, hold meat loaf together, keep oil and vinegar from separating in mayonnaise, and form crystals in candies. They spin magically into meringues and thicken smooth custards. Eggs build cake batters by providing the structural framework, and produce finely grained ice creams, enrich soups, glaze pie crusts. What other food can do all this? It’s said you can tell a great chef from a cook by the way they treat and use eggs. Learn the chemistry behind the magic of eggs in this egg-splicit, egg-citing workshop. Learn the essential of preventative disease management that utilizes proactive care to keep your flock healthy. You will learn about considerations for housing, air quality, feed, water and special challenges that you might face with your flock. You will learn how to treat the most common diseases as well as wounds and trauma. Includes hands-on administration of treatments and wound care. Learn how to use or make simple, but effective treatments without prescription drugs. This workshop teaches you what you need to know to avoid most veterinary bills. This cutting-edge, ever-expanding, interactive workshop gives you practical, and effective ways to employ chickens in your garden or homestead. Learn how chickens create and enrich topsoil. Learn how chickens forage—and which food they prefer. Use your yard as a mini-pasture (including rotational grazing systems) to build soil fertility, provide fresh graze. Control insects, including ticks and fleas. Integrate different types of fencing by understanding what works, and what doesn't. Jump start your gardens with chicken-assisted biomass recycling that transforms trash into black gold. Begin birdscaping, which is planting trees, shrubs. perennials and annuals that your flock will perpetually love. And not all chicken feed has to come from bags. There are many crops you can grow in your yard to feed your flock. Learn how chickens forage and what plants they prefer. Use your yard as a mini-pasture, including rotational grazing to build soil fertility and provide fresh graze. This ever-expanding course goes into detail a crop’s life-cycle to understand when, and how, chickens can be incorporated for insect control, fertilizing, soil management and harvesting. Best of all, we will talk about getting truly wholesome, nutritious, non-GMO homegrown food for both you and your flock. This is truly a “Think Outside the Coop and Inside Local Food Systems“ workshop. The chickens in your family flock have skill sets that can be used to create compost, fertilize and build tilth in top soil. And simultaneously, they help decrease the amount of “trash” that is collected by the solid waste management system. Learn how your feathered bipeds can serve as clucking civic workers to help save BIG TIME tax payer dollars and as Partners Toward Zero Waste for communities and counties. Using, managing and understanding broody hens is almost a lost art. And yet, broody hens happen. With the surge of family flocks, many poultry owners are wondering what to do with their broody moody biddies. From our literature searches there is very little practical information about employing hens to incubate eggs, and brood chicks naturally. In many ways, this is a key not only to family flock self-sufficiency, but also to preserving the heritage breeds. Course facilitator Patricia Foreman. Textbook: City Chicks. 10. Course Review, Q&A. This final class is a review of the entire course to highlight the understanding of key concepts. The exam is used as a learning tool. No one fails the exam except by not turning it in after the final review. President, The Gossamer Foundation is a nonprofit dedicated to Global Sustainability and Local Foods. <https://chickensandyou.us6.list-manage.com/track/click?u=067ee0ed82884a8f51dc4912b&id=577e38d9e9&e=ab6229448e> Class size limited. Begins January 9th, 2019. PLEASE REGISTER SOON! to create sustainable households, communities and help our planet. Copyright Â© 2019 The Gossamer Foundation, All rights reserved. You have expressed interest in hearing about our upcoming Chickens And You events at a special event you attended.